Thai food is so flavorful and fantastic. I first encountered Thai cuisine when I was living in Canada. My loft was in the heart of downtown Hamilton, and located just one block away from My Thai, which became one of my favorite restaurants. Because I had never had Thai food while living in the states, the menu was foreign to me. I loved to try new things, and usually loved them. My husband and I went through a season where we ordered Thai takeout at least once or twice a week for several months. I usually got the pad Thai, a coconut soup or Tom kha gai, and something else, maybe a curry or my favorite….basil chicken. I am a sucker for rice with delicious sauce, so Thai basil was a natural choice. It has such a flavorful sauce with sweet and spicy elements, and the licorice tasting Thai sweet basil adds so much to the dish. Originally the sauce has sweet soy, but I have not yet found a gluten free sweet soy. This recipe doesn’t contain sweet soy and is a glutenless adaption of Foo Swasdee’s recipe. Both soy and oyster sauce contain gluten so make sure you are buying the specified products, or a glutenless alternative. The Thai chilies, Thai sweet basil, oyster sauce and fish sauce can be found at an Asian market or online. Combine the sugar, oyster sauce, fish sauce, soy sauce and chicken broth in bowl. Heat the oil in large saucepan. Add mashed garlic, chilies, and onion and brown for 30 seconds. Add the chicken and cook until the outside turns white. Add the bowl of liquid ingredients, the red peppers and the mushrooms to the saucepan. Combine cornstarch with small amount of hot water and whisk. Add to saucepan. Simmer until chicken is done, 5-10 minutes. Add the basil last. Serve over steamed jasmine or white rice. 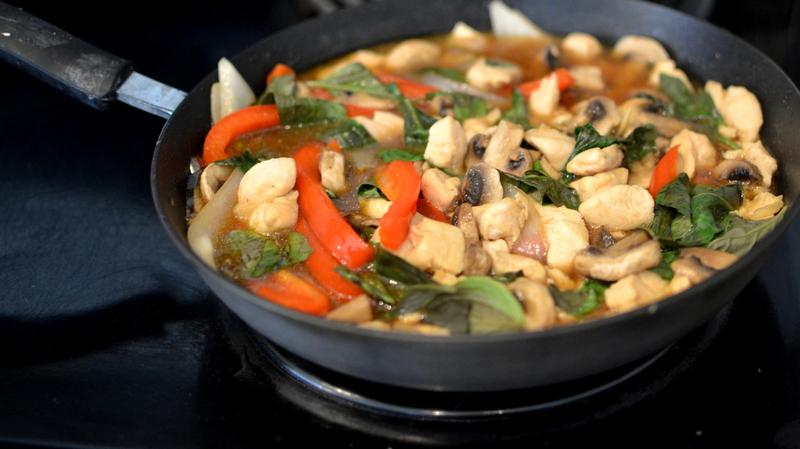 This entry was posted in Thai Recipes and tagged basil, Basil chicken recipe, chicken, chili, gluten free blog, gluten intolerance, gluten-free, recipes, sweet, sweet soy, Thai food, thai recipes, Thailand.